I've become newly interested in the concept of freezer cooking. There are a lot of great resources out there, including books (I got a few for my birthday) and websites galore. It's a great concept that in some form we've been following for a while. Anytime we make spaghetti sauce or soup/stew, we make extra and freeze it. But that's only the beginning to what you can do to avoid cooking during the week. There are resources out there that teach you how to cook a month's worth (or another time period) of meals on the weekend and freeze them for your use during the week. Emilie (you may know Emilie Ahern from one of my favorite craft blogs em-il-ie handmade) did a series on everything you needed to do "Freeze-a-thons". Once a Month Mom also has some great information, including a monthly menu and instructions. 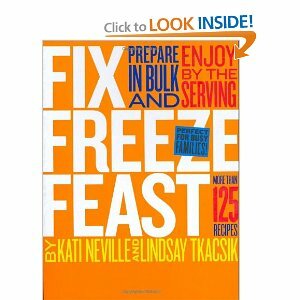 And one of my favorite local coupon blogs, Denver Metro Mom, has some great posts on the subject, including one about what you can freeze. I'd love to give you some feedback on the great recipes I've tried, but I quickly realized a big problem. I don't have a stand alone freezer. Which means I can't fit much if any of this stuff in my freezer. So needless to say, I've only tried a couple recipes. 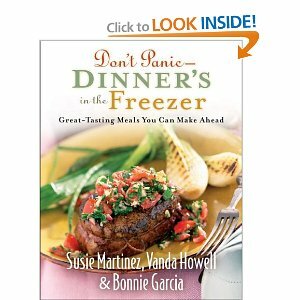 Have you tried any freezer cooking?